Darcy is a qualified marine biologist. She just moved to White Cliff Bay where she is starting a job with the council as a Community Development Liaison Manager. She really wants to make this job work as she has had various positions that have not lasted and she has become a big disappointment to her high achieving parents. Her move to White Cliff Bay was prompted by the death of her aunt Ginny, who lived in a caravan in the area, and when cleaning out her possessions Darcy came across a locket left to her with “Don’t let anyone tell you your dreams aren’t good enough” inscribed in it. Darcy has fond memories of visiting her aunt and exploring the beaches and the sea and wants to start fresh with enthusiasm. On her first day in White Cliff Bay she has a run-in with the grumpy and elusive Riley who lives on Rose Island in the lighthouse his Grandfather built. Unfortunately they find that they often have to interact with each other due to the fact that Darcy decides to help the local community in their quest to save the lighthouse from being destroyed by the council. Will they be able to manage that? Darcy is an amazing character and I liked her because she is warm and friendly. She easily makes friends and tries to see the best in people. Within a couple of days she has a good relationship with quite a few members of the local community. Darcy often gets herself into little mishaps that had me giggling, especially when she meets her neighbours for the first time. Her background with her family shows her vulnerability and lack of confidence in herself. I wanted her to be more confident and pleased with her choices as well as pushing herself to do what makes her happy. Darcy has a few difficult decisions to make and I couldn't wait to find out where they would lead. The gorgeous Riley is a great contrast to Darcy's character and I understood his attitude because of his background. It is nice to see a change in him as the book continues and I liked that at a certain point he realises that people aren’t just being nosey, but really want to help him, because the lighthouse also means a lot to them. I loved reading about both Darcy and Riley and kept hoping they would find a way to get along as they are perfect for each other. 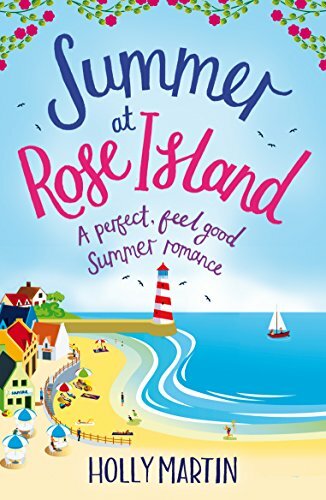 I enjoyed reading about all of the great characters and together with a fabulous setting this makes Summer at Rose Island a fantastic read. The book drew me in from the first chapter and I continued to enjoy it more every page. There are little side stories that run alongside the main one that increased this enjoyment. I was held in suspense until the end of the book, as to if the lighthouse would be saved and if Darcy manages to feel like she has achieved her potential. Like all great books there are ups and downs in the moods of the characters and Holly Martin describes them with empathy, which makes her story more realistic. Summer at Rose Island is a book that grabbed my attention from page one with its fabulous descriptions and warm characters. If you like romantic stories I'd highly recommend Summer at Rose Island and wonder if you will fall in love with the characters as much as I have or if you find yourself giggling at some of the parts and wanting to cry at others? This is one of three books set in White Cliff Bay, however it can easily be read as a standalone. I live in sunny Bedfordshire in a house with round windows. I studied media at university which led to a very glitzy career as a hotel receptionist followed by an even more glamorous two years working in a bank. The moment that one of my colleagues received the much coveted carriage clock for fifteen years’ service was the moment when I knew I had to escape. I quit my job and returned to university to train to be a teacher. Three years later, I emerged wide eyed and terrified that I now had responsibility for the development of thirty young minds. I taught for four years and then escaped the classroom to teach history workshops, dressing up as a Viking one day and an Egyptian High Priestess the next. But the long journeys around the UK and many hours sat on the M25 gave me a lot of time to plan out my stories and I now write full time, doing what I love. I have been writing for 6 years. 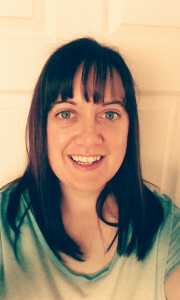 I was shortlisted for the New Talent Award at the Festival of Romance 2012. My short story won the Sunlounger competition and was published in the Sunlounger anthology in 2013. I won the Carina Valentine’s competition at the Festival of Romance 2013 with my novel The Guestbook. 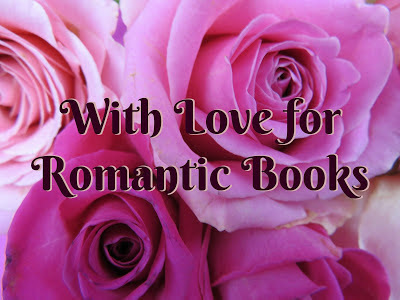 I was shortlisted for Best Romantic Read, Best eBook and Innovation in Romantic Fiction at the Festival of Romance 2014. I used to scuba dive shipwrecks all around the UK. I have climbed the tallest mountains in England, Scotland and Wales. I'm terrified of spiders. 2. You have had a varied career including a hotel receptionist, bank clerk, teacher and a History re-enactment person. I imagine that this allows you to draw on lots of experience for characters. Which one of these jobs if any has the most influence on your writing? Probably working in a hotel because we used to have different guests and events everyday and we never knew what to expect, a lot of the things that happened have found their way into my stories one way or another and my job there heavily influenced my story The Guestbook and the people i met helped to shape the characters. 3) A lot of your books are often about the same place or characters such as this one and a Hundred Proposals. Do you intend to do this when you first get the idea or does how the story develops give you the idea to write another one? With One Hundred Proposals it was only supposed to be a standalone story but people fell in love so much with Harry and Suzie that I felt like I had to give the readers more. With Christmas at Lilac Cottage and Snowflakes on Silver Cove, I wrote them both at the same time and they are set in the same week in the same town so they were deliberately written like that, with some of the key events cropping up in both books but told from different points of view. The plan was always to do another book set there in the summer too. 4) Which is your favourite book of all the ones you have written and why? That's so hard to choose, I love One Hundred Proposals because the love story is so special for Harry and Suzie, and I love Snowflakes on Silver Cove as George is so completely different to my other male heroes and the story is really funny but the story I loved writing the most was Fairytale Beginnings, I had so much fun writing that story with the secret passages, ghosts, and buried treasure. It was like a Famous Five for adults. 5) What are your five romantic books that you would tell someone to read and why? 6) Summer at Rose Island makes me want to go on holiday. When going on a holiday what is the first thing you think to take with you? Also what is your ideal holiday? I always take my camera and make sure I take my samsung tablet as it has my kindle books on there for plenty of reading but also it has Word so I can write if inspiration grabs me. I like to explore places, cities, remote locations or places with history too. 7) Your book contains a lot of knowledge about Sharks and other sea life. Did you have to do a lot of research for it, and if so what? Yes I did a ton of research on sharks and sea life for this book. I spoke to marine biologists, aquariums, researched online about different sealife and spoke to The Shark Trust especially about the Angel Shark and whether what I said about that shark was accurate. It was important to get that part right. 8) What is your favourite animal? I love sea creatures, dolphins, whales, starfish etc but my favourite animal is the giraffe as there is nothing else like it in the animal kingdom. 9) Are you a kindle or paperback person and where do you read? Spring at Blueberry Bay, Rome's story is in the summer book and Eden's story is in the Christmas book. Each book is a full length standalone story and can be read separately and in any order but are linked because its set on the same island and you'll see the siblings as background characters. One very lucky reader of With Love For Books will win a digital copy of Summer at Rose Island by Holly Martin. The book review sound intriguing. Thanks for sharing. Love the cover and interview too. What a wonderful book for summer reading! Thanks for sharing. This book looks great ! I love your cover ! What a lovely summery feel your book has makes me realise I will be sitting on a beach before too long. This book sounds great. I will definitely have to check it out. Thanks for the awesome review! I love a light romance for summer reading! Great interview. The book lures me in, can't wait to read it. A nice book for summer reading. The research on sharks for your book must have been really interesting. I have just finished a fiction book (Hushed by Joanne Macgregor) set in South Africa and features the marine animals including sharks and whales. I love this type of romance for summer reading! It make me smile! Great interview. Great review sounds like an interesting book. This sounds like a wonderful book. I'd love to read it.